The whole purpose of this article is to bring out some very basic facts about home selling dynamics in the QCA. To show what works and what does not work and make sure you are aware of them. It's a Buyer's Market in QCA . . .
Real estate market in the QCA has been and will always be a "Buyer's Market". The majority of our customers have been extremely successful in pricing their property correctly and selling them quickly. Their success has been the main reason behind our success. However, a small minority of them have not been able to price their home correctly and have not been successful as FSBO as a result. The most common problem we have seen is to convince them about one simple thing. It is not a problem with the exposure, it is their price. Unfortunately many of them leave QCFSBO® thinking that listing on the MLS with a Realtor will probably do the trick. As we have noted, the MLS is a concept of exclusivity that has come and gone. It does not bring any additional exposure. If a property does not sell on QCFSBO® in 60 days for a certain asking price, it is quite unlikely that it will sell for a higher price, with or without a Realtor. Typically when these sellers leave QCFSBO® to list with a Realtor, many end up lowering the price AND paying a 5-7% commission on top of that before a sale occurs. Some of them return to QCFSBO® realizing that they cannot afford to lower the price and pay the commission at the same time. When they do return, they usually sell very quickly this time around as they have learned to price their house more realistically. Top Bar Graph: House sells for $200,000 as FSBO - You walk away with all of your equity - $60,000! 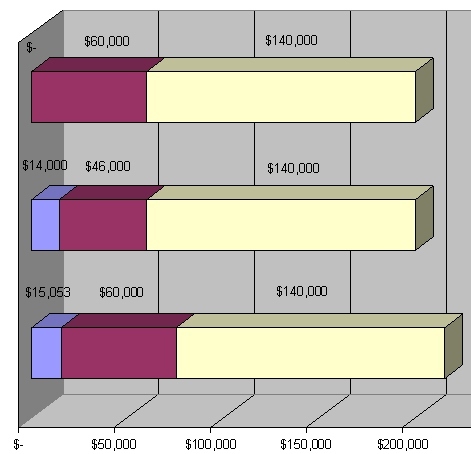 Middle Bar Graph: House sells for $200,000 with a Realtor - Real Estate Commission comes out of your equity which has now reduced to $46,000! Bottom Graph: You must sell the house for 7.5% more at $215,053 to walk away with the same $60,000 equity! What Can You Do As a Seller Before Hiring a Realtor? The QCA has always been a Buyer's Market even though properties in some areas sell much faster than some in other zipcodes. This variance doesn't make a rule, though and it is almost impossible to overcome the cost advantage of a FSBO seller in this market. The National Association of Realtors (NAR) may show that Realtors bring higher selling price than FSBO's nationally, it is not what is common in the QCA. As we have said often, if a QCA property does not sell from QCFSBO® in 60 days, it is unlikely to sell for a higher price with or without a Realtor unless the property is updated or additional incentive is included for the buyer. As a seller, you must do the simple 7% math. If you have listed on QCFSBO®.com for 60 days and have not received a single acceptable offer, what are the chances that you will get an acceptable offer 7.5% higher in the next 3-6 months? If you want to start with additional negotiating room then you want to start at a price 3-5% higher than SP shown above. In the example shown above that will mean you need to start at $225,805 with the Realtor.The most critical question you need to ask yourself here is ... if a property did not sell at $200,000 on QCFSBO® in 60 days, how much interest are you going to get if you price the same property over $225,000 with a Realtor or even at $215,000? Believe it or not, we have seen this happen repeatedly with some of our customers deciding to leave QCFSBO®.com and listing with a Realtor, some 20-25% above their last asking price on QCFSBO® . The whole purpose of this article is to bring out some very basic facts about home selling dynamics in the QCA. To show what works and what does not work and make sure that you do not go down the same unsuccessful path.